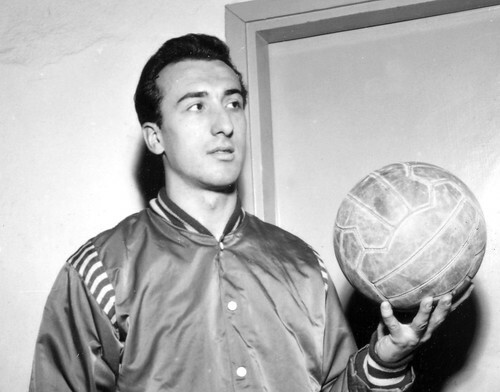 Sandro Gamba began to play basketball in 1945, when he was 13 (he was born on June 3rd, 1932). On April 25th he was hit by a machine gun while Italy was about to reclaim its independence. Basketball was soon to become a magnificent obsession but at the time it was used for medical reasons. It was great to reacquire the use of the right hand. Five years later he made his debut in Series A and immediately won his first championship, under the wing of Cesare Rubini, his friend, his mentor, his bigger brother basically. Gamba won 10 championships as a player, all with Olimpia, the only team he played for, he’s been team’s captain but also the symbol, a player with gut and leadership abilities more than talent and skills. Those traits defined him as a coach later in his life. Gamba was the coach on the court, a star for the Italian National Team and mostly a terrific defensive player. During the 1960 Olympics in Rome, where he was the captain of the team coached by legendary Nello Paratore, Gamba was selected by Nasa: he had the physical attributes and the mental toughness to be an astronaut. He turned the proposal down and started a second career in 1965. As a coach. And the second stage of his life was not less spectacular than the first. As a Cesare Rubini’s assistant, he basically had two positions, general manager (he was responsible for many American player’s signings) and coach “de facto”. After building Olimpia in the Sixties and early Seventies, he moved to Varese, where he won two more championships and two European titles, with the Italian National team he won the silver medal at the 1980 Olympics and the gold at the European Championship in 1983. As a coach he developed a web of friendships and contacts the made him very popular and well-connected in the United States. His credibility is sky-high and made him a lock to be elected into the Springfield Hall of Fame.